If you ask any rosarian what their worst enemy is, black spot will probably be one of the top 5 answers. This fungus can come out of nowhere and take down your rose bush if it is not handled quickly and properly. So, what is this nuisance to rosarians? It is a common rose disease that causes fungus all over the foliage of the plant. If it is left unchecked or untreated, it can cause the entire rose bush to lost its foliage. Many roses will be effected by some level of black spot during their lifetime. Signs of this fungus are exactly what the name portrays – black spots all over the leaves of the plant. Dark spots will appear on the upper leaves and cause them to turn yellow and fall off. The canes of the bush can even be effected. Warm, moist, and humid conditions are exactly what the black spot fungus loves. You can remove diseased leaves once you notice them to keep the fungus from spreading. If your rose bush gets attacked by black spot, it can be cured but the damage to the foliage can not be reversed. The fungus can be killed, but you must allow the damaged leaves to fall off once they die. 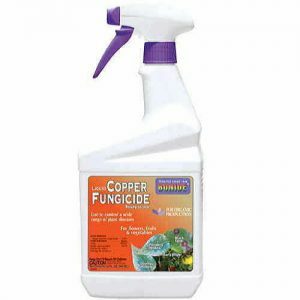 There is an easy way to stop and prevent black spot – Bonide Copper Fungicide QT – this spray is safe to use on roses, vegetables, fruits, and many other types of flowers. It will prevent the spread of black spot as well as other fungus such as late blight and downy mildew. Some rose bushes are bred to be disease resistant, those include: April Moon™, Moondance, Enchanted Evening, and many more! You can visit our page which compiles a list of disease resistant roses here. 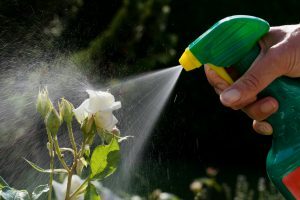 Roses in a garden are sprayed with a fungicide. Practicing good garden hygiene is an essential part of black spot prevention. During blooming season, overhead watering should be avoided. As we stated before, this fungus loves to grow in moist conditions. Removing dead and fallen leaves from below the plant is also important. Prune back any dead or diseased canes back to their healthy wood. The goal is to keep airflow clear throughout the rose bush so water and moisture can not be trapped. An easy at-home remedy to prevent black spot is baking soda. This can help balance the pH levels and therefore making it more difficult for the black spot to infect the plant. To make this easy solution, simply mix a few tablespoons of baking soda into a gallon of water and spray or pour onto the foliage of your rose bush. Reapply after rain. Another preventative is to ensure that your roses receive plenty of sunlight. Since black spot loves moisture, plenty of sunlight will help the plant’s foliage to remain dry and not create a breeding ground for the fungus. Don’t forget to give your roses a sun-loving companion! No need to fear – black spot can be stopped!